There is no doubt, that bringing your ‘best friend’ along to a wedding day is becoming increasingly popular. For some couples, the ceremony just wouldn’t be complete without their beloved four-legged friend by their side. You wouldn’t leave your child at home on your special day, right? So why leave your lovely lab? You may want your fur-baby to accompany the two of you in some beautiful ‘family’ wedding portraits, or perhaps you’d love your pug to be a ring bearer. You can dress them in an adorable top hat or flower crown. And there’s even purpose-made ring bearer coats and collars available to fit big and little pets. If you’re fans of the “less-traditional” animal, there’s no need to shy away from including an Alpaca, your pet goat or even your horse? But remember, including your fuzzy friend requires a bit of wedding planning. Is your pet’s personality calm tempered? Overly friendly? Will they be comfortable around the guests? Will the guests be okay with your pet? 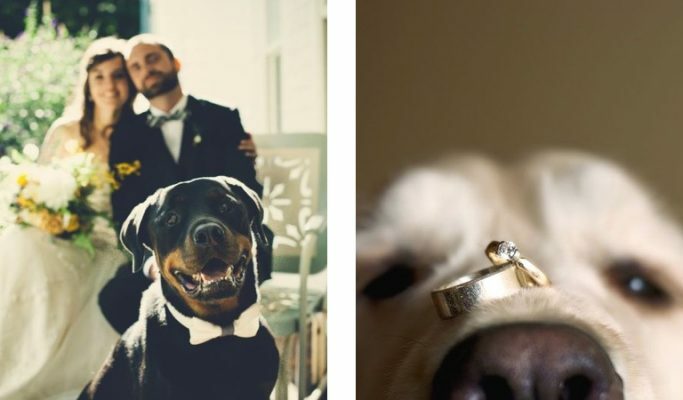 Do you need to decide on a specific role for your pet… a ring bearer? A guest of honour? Best man? Before you set your heart on it, check first that animals are actually allowed at your venue. Make sure your pet is comfortable with what you want them to wear. Check with your photographer, so they can plan ahead for some really nice shots. You could even put together a little scrapbook of the kind of pics you’re after. If you have a larger pet like a horse that you want to have included, you will also need to discuss locations and moving your pet around. Rehearse the ceremony with your pet and even a few friends to get them used to it and also make sure that they will want to do it. Organise for a friend, or a professional wedding pet assistant to do a pick up once the ceremony and photos have all finished. Most venues will not be allowed to have a pet around the food service areas. 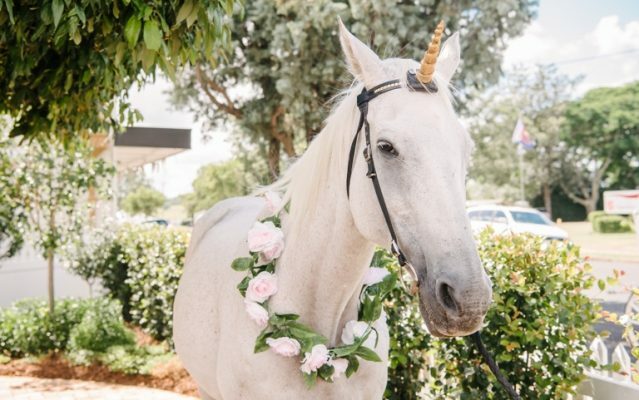 A company like First Class Pet Sitting have a team of vets, vet nurses, dog behaviourists and animal handlers who can provide a highly personalised pet assistance service from pre-ceremony to post ceremony . Contact Gillian on 0403 262 360 or by email. ‘First Class Pet Sitting’ can even supply a range of outfits for your pet including tuxedo, bowtie, handmade flower collars, flower girl dresses as well as ring pillow, ring pocket and “Just Married” plaques. So, while you’re planning your special day with perfect music, the right wedding dress and a delicious reception menu. Consider if the day would be even more ‘Paw-fect’ with Rover, Tiger or Rusty, walking next to you up the aisle.